Berlin, capital of the unified Germany and symbol of reunification between East and West, is one of the most happening cities to visit in the world. With its trendy nightlife, and fascinating arts scene and history there is something there for everyone. Air:- Berlin is served by two airports, Tegel and Schoenefeld. The former being the larger one where the bulk of flights plus occasional long haul flights are served. The latter is smaller and mainly served by low-cost airlines. A new larger Berlin Brandenburg Airport is scheduled to open later in 2017 superseding these two. Rail:- The larger multi-layered Hauptbahnhof is the main station from which most journeys go from. Night services from cities such as Amsterdam, Paris, Vienna and Budapest come through here as well. The Berlin-Warsaw Express operates from Ostbahnhof and takes no more than 4.5 hours. For a city that bore the scars of World War II and aspects of the subsequent division between East and West, many echoes of the city’s turbulent history are at every corner. The Brandenburg Gate, the definitive symbol of Berlin to many, marks the very centre where the wall once stood. As people walk through, it seems unthinkable that here a large section of the wall complete with strict border guards on the lookout went through the back of this symbolic feature of the city, now an essential selfie spot. 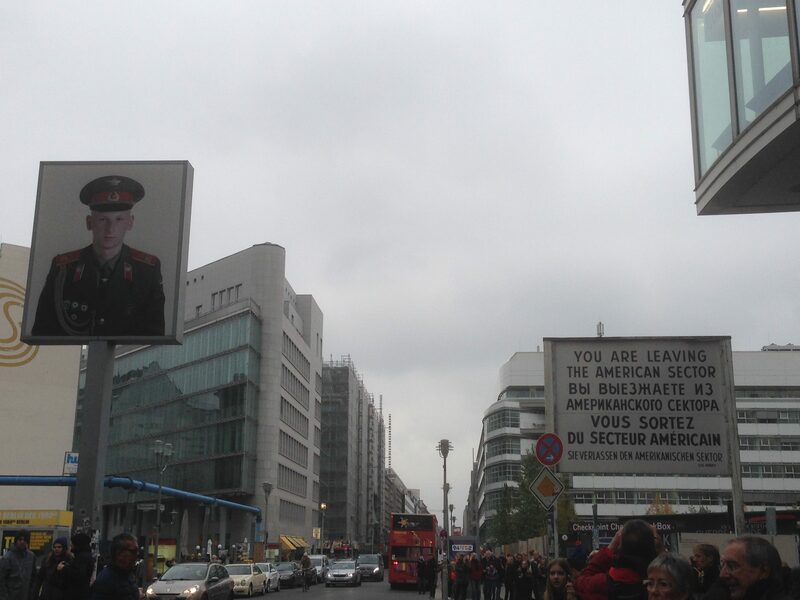 Further east, Checkpoint Charlie, the former border crossing now houses museums and a detailed history guide on the walls. 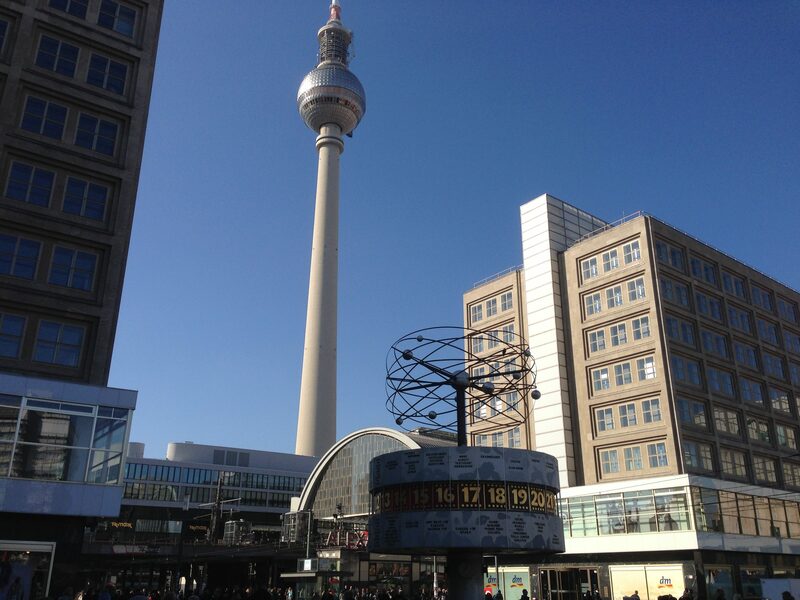 The Fernsehturm (TV Tower) in Alexanderplatz represents Berlin’s tallest building and prime viewing spot. Also popular as an eating and drinking location, and with such impressive views you cannot argue with that. But with popularity comes long waiting times, so a pre-booked reservation may also be necessary! 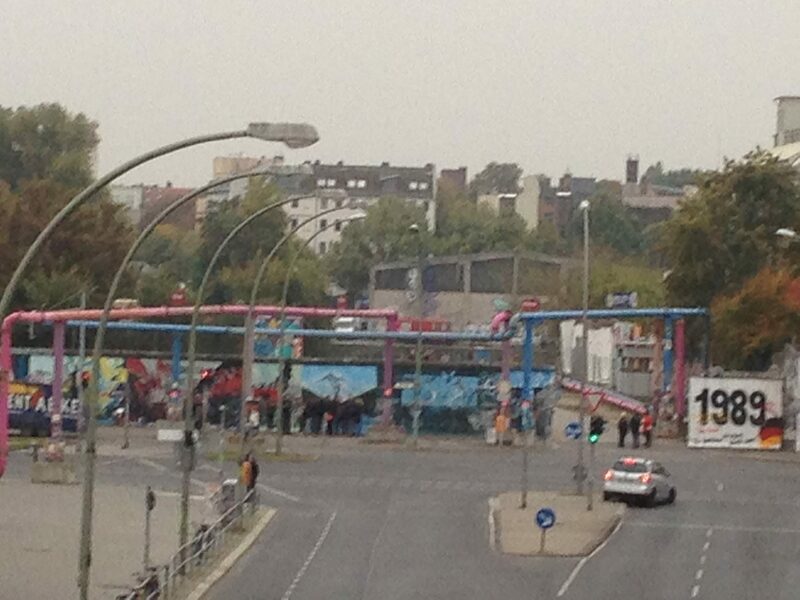 Running along the alternative Friedrichshein-Kreuzberg district is the East Side Gallery. Take a walk along here towards the Oberbaum Bridge and observe the interesting way in which part of an oppressive structure has given way to artistic freedom of expression. 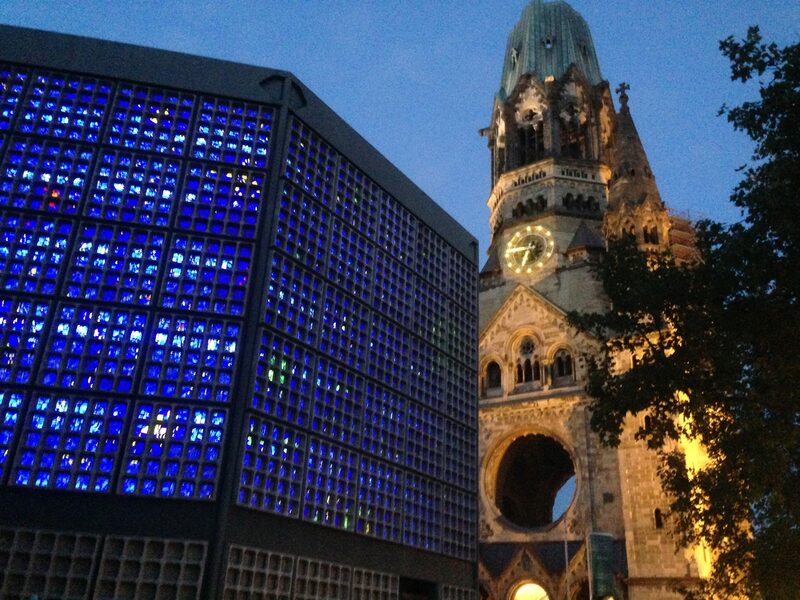 Berlin was one of the most significant locations for the horrific events of Kristallnacht in 1938 where all traces of Jewish identity were ransacked and purged from Germany by brute force and the main synagogue was burnt down. Today, a beautifully intricate re-incarnation of its elaborate Moorish exterior stands on Oranienberger Strasse (below, left) as a symbol of atonement in this city of rebirth. Closer to the Reichstag is the Holocaust Memorial, unveiled to the public in 2005 (below right). 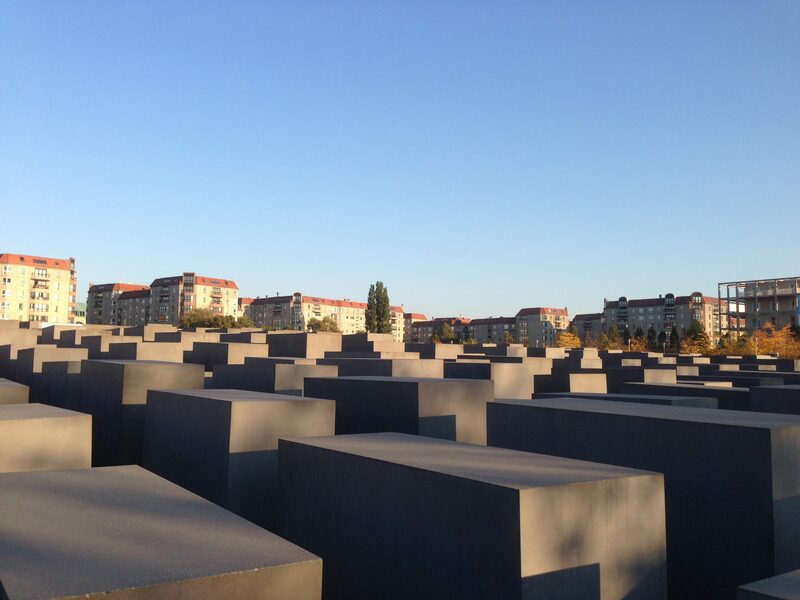 The maze of concrete blocks in varying height leave the visitor open to their own interpretation of this monument to one of the most horrific chapters in modern history. The reconstructed Reichstag building complete with its glass dome cupola lies adjacent to the Brandenburg Gate. This provides a wonderful view of the city from above especially at night, and is open to the public. The city’s two most famous cathedrals – the Kaiser-Wilhelm (below right) and the Berliner Dom (below left), both destroyed in WW2 show different aspects to reconstruction. The former (at the end of the Ku’damm), still in its partially destroyed state but with a modern chapel adjacent to it. 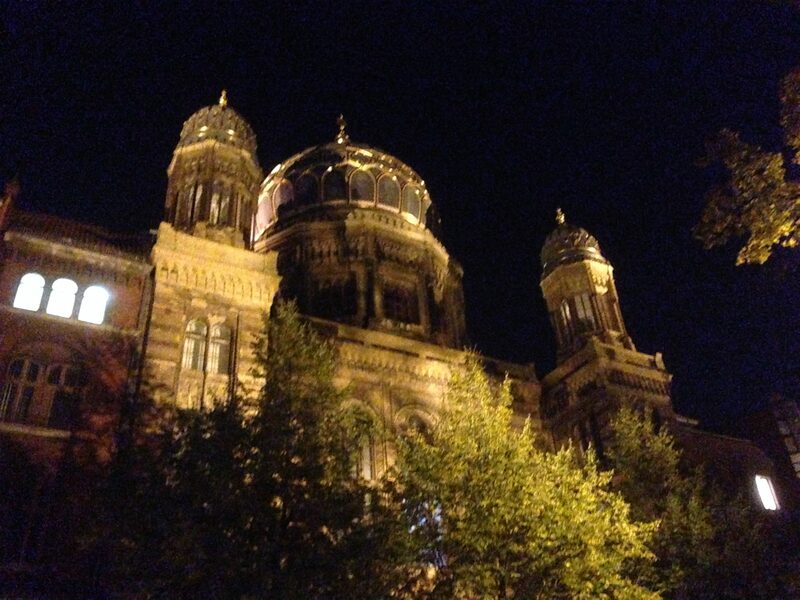 The latter, on Museum Island, restored to its full Baroque domed glory. The variety of museums in Berlin cater to a diverse area of interests. Most notably, five of its most illustrious are located within a short distance from one another. Two specific museums that served as the headquarters for two different periods of totalitarian dictatorship that cast their shadow over Berlin have now been preserved as museums that tell their detailed stories. The Stasi Museum located in the high-rise building that was the former headquarters of the aforementioned state police provides many exhibitions and displays of said organization. The offices of Stasi agents remain almost untouched and today serve as a detailed research centre of the activities of the former GDR. A visit to the Topography of Terror is essential. This site of the Gestapo HQ is unique in that has a mixture of both indoor and outdoor exhibitions that educate on the rise and fall of the Third Reich. Something evoking the past but in a much more light-hearted way is Der Computerspiele Museum on Karl-Marx-Allee. If, like me, you are old enough to remember the early days of arcades and the ZX Spectrum, this place feels like multiple Christmases and birthdays rolled into one. This museum has restored many old computers and arcade machines – coins not needed! And here you can play Space Invaders as much as you like, non-stop nostalgia! Kurfurstendamm (or Ku’damm for short) is the unmistakable epicentre of all shopping and entertainment activities. 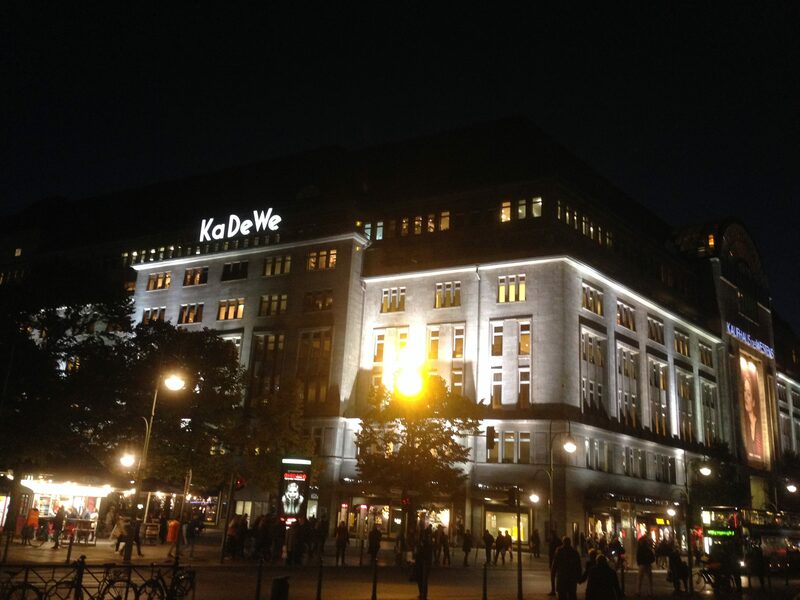 A lengthy tree-lined boulevard that begins at the lower end with the iconic KaDeWe department store and stretches further along. This is the general location for all your typical stores including those of the high-end variety. Alexanderplatz (location for the TV Tower) is always a busy location that serves as the most common transit point in Berlin. An interesting location nonetheless for a look at classic East German architecture of the equally uninspiring but fascinating kind. Although not “buzzing” in the sense that it attracts so many people, a walk along Karl-Marx-Allee (adjacent to Alexanderplatz), is worthwhile. A grand boulevard that encapsulates a feel for typical Soviet inspired architecture that can fascinate and recoil at the same time. For an authentic feel that takes you back in time, this is the best place to stroll. Kreuzberg (to the south of Checkpoint Charlie) is very much the student and alternative hotspot, always lively at night. Same goes for Prenzlauer Berg, north of the Spree. Again, another area that has become a byword for gentrification and where former squatter houses have turned into all-night raves. For a city known for urban grit, Berlin does have more than a fair share of parks and such spaces to ride a bicycle, observe wildlife or just chill out and have some quiet away from the big city. Tiergarten is a short walk away from the Reichstag. Connecting is the 520 acre greenery of Unter den Linden boulevard. Further west at the Charlottenberg end of Ku’damm is the large Grunewald Forest. The presence of conifers and pine trees provide a great escape from the big city hustle and bustle. And like many cities Berlin has its own Botanical Gardens (close to the Frei Universitaet of which these are connected). This has its own glass pavilion with cacti and other desert plants as well as a beautifully designed Japanese Garden. For families, a day out at Berlin Zoo is a must. Visiting the adorable baby panda bears is one of the stand out parts of the zoo. Much so that the zoo itself is dedicated to many international conservation projects that focus on the protection of endangered species worldwide. 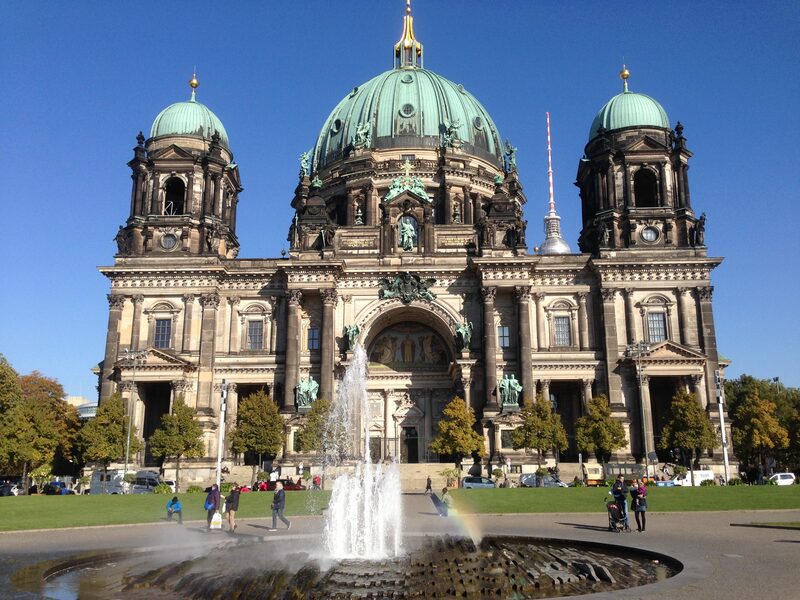 Ideally when booking accommodation, anywhere in the boundaries of the Mitte is the best option. For a cheaper alternative but a decent enough area then staying in the Friedrichshain would also be a respectable choice. This is well-connected to many U-Bahn stops that take you to the centre and is also close to the very “hipster” areas, too so handy for the night owls among us. Berlin is a huge city but with a very well run U-bahn, getting around is very straightforward. A ticket covering tariff area “ABC” (in other words the greater Berlin area including suburbs like Potsdam) costs €3.30 for a single journey and €7 for a day and €30 for seven days. The Berlin WelcomeCard is the city’s official tourist pass allowing free unlimited travel on all public transport and up to 50% discount on museums and attracttions. There are varying options depending on how long you wish, so starting from €19.50 for 48 hours in zones AB, €27.50 for 72 hours and €41.50 for six days the choice is yours. If you want one covering zones ABC then it should cost only €2 more than the AB equivalent. These can be purchased from information offices at Tegel Airport, the main Hauptbahnhof or the Europa Centre on Ku’damm near the zoo.